Thanks a ton. Will try it out. I have the original LTD and it's one of the few pedals I'll keep so this is definitely on the list. The IC seems pretty shy though, is there any other similar you'd suggest? JRC4558, RC4588P maybe? what would be a similar circuit to this? is it tubescreamer based? There are similarities to the Tubescreamer, but only in standard audio electronic practices such as diodes in the feedback loop. To me Dave has taken ideas from a number of different pedals (or audio circuit snippets) and brought them together in this. The first gain stage is most similar to a TS, but not identical and with an additional presence control. That's followed by a Big Muff tone stack, followed by an active mid and bass control. There are a lot of good ideas that have gone into this and it should make a really versatile effect. Sounds very very good. It's really a great design. I don't know, but presence seems to be quite unnecessary. It may be in my build, but it does next to nothing - mainly it just dials the amount of low frequency hiss, from none to some. Bass and middle controls are amazing. Tone control feels really numb with those two on board... It's very articulate and doesn't get mushy at all on bedroom volumes and it's not piercing sharp either. Perfect middle ground. Anyway. Great OD. Totally different from classic ODs with good and wide controls. Definitely recommended buy or build. Ooops! I made this about a month ago and completely forgot to update! Sorry... Yes the presence doesn't seem to do much at all. If I make another I would probably omit it. Yeah. I'm going to replace it's wires with 10K resistor before i box it..
LOL! No just this one. I completely forgot about it. Done. Used 8.2k in place of 13.3k and 47n in place of 27n; Great overdrive, I think its gonna stay on the board; best TS alternative after the zen. Like i said above, i omitted the tone and presence pots from the board and replaced them with link wire from tone 1 to tone 2 and 4K7 resistor between presence 1 and presence 2&3. Then i took vol 3 to my little utility board (depicted here: http://mirosol.kapsi.fi/varasto/boxes_other/amz_swtc2.png) and sticked that's output to volume 3. Yes. It eats up a bit of level from the effect, but it is still loud enough. Now there is active low, active mid and passive high controls on the LTD Silver sound! Which makes it really nice OD. I think i got a bit better volume control using B100K. Even C100K would probably work great. One option for this fine circuit would be to use dual gang pot for mids and bass.. Anyway. It was fun to build and mod - and it sounds really good. Better than TS9 definitely, but not as good as Klon :) It's in a box, and i'll get a photo of it as soon as get some decoration done on it. 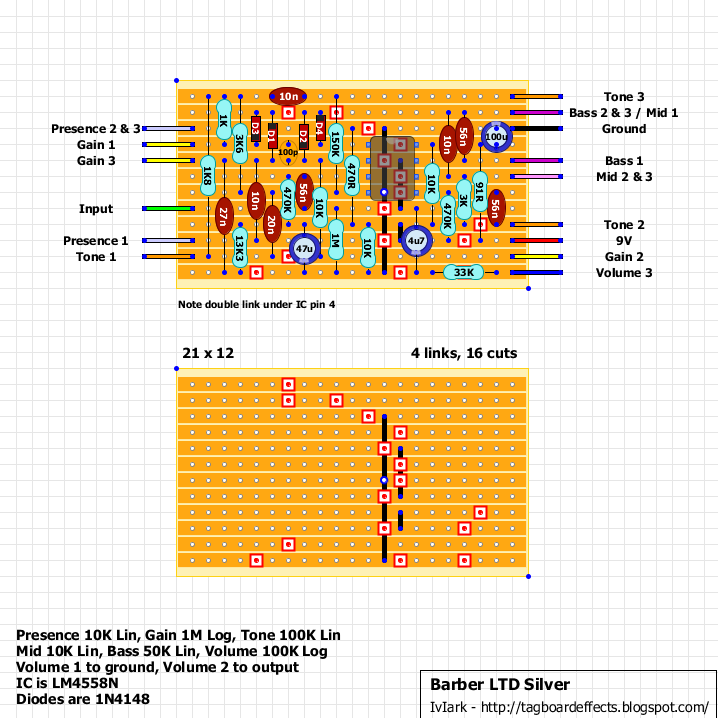 I've just completed my LTD using a slightly differant lay out from DIY Stompbox forum. All the components match the above its a very nice OD sounds sweet,But!its output is low I have to crank my amp way up?? I was expecting a boost? Any body else have this problem any fixs? I'm not close to unity with all knobs maxed, more debugging needed. Shame I didn't this excellant site befor I started my build marks layouts look tidy & verified. Mirosol's idea of the tone control rules..... :) after reading it I did the same mod and now it rocks, but I used 8.2k in place of 13.3k and 68n in place of 27n and 500kA gain pot........its total awesomeness now. I have a query for mirosol.......with this tone mod , the treble control is also adding more volume as we turn it clockwise and the volume knob is rolling off some treble as well on turning CCW, is it supposed to behave this way ? and can we do the treble bleed mod on the vol pot? 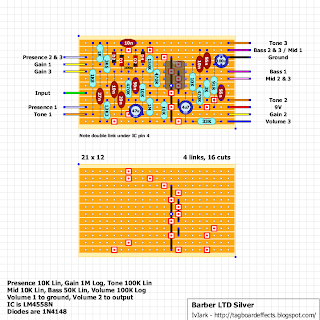 that is putting a 130k resistor and 1.2nf capacitor in series between lugs 3 and 2 of volume pot..... Pls suggest. I've built it and it worked fine until suddenly the drive knob stopped adding any gain and it now sounds kinda like a clean boost.